You are currently browsing the Columbia Hearing Center blog archives for January, 2013. The “head-shadow” effect is one of several extreme disadvantages that people with a deaf (or nearly deaf) ear experience. Sound which originates from the direction of the deaf ear must travel around the head to the better hearing ear in order to be heard. The path of sound as it travels over the head may attenuate low pitch sounds by as much as 6.4dB to as much as 20dB for high pitch sounds. Therefore, you could imagine that one strategically placed high frequency weighted word in a sentence such as “missed” could easily lead to a spicy conversation. 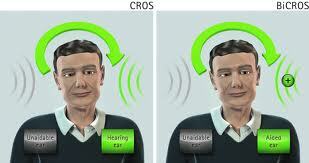 One manufacturer we have found, Phonak, has a very good solution to this call a wireless “CROS”. 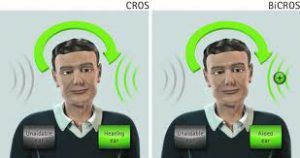 In a CROS system, a transmitter placed behind or inside the poorer ear picks up sound and transmits it wirelessly to a receiver either behind or inside the better hearing ear. If needed, the receiving device may also act as a hearing aid if there is hearing impairment in the better ear. Whereas several disadvantages to single sided deafness (SSD) still remain, one very positive result is an elimination of the head-shadow effect. The benefit for our clients has been clear as so far all of our SSD cases that have experienced both one hearing aid and a CROS fitting, have opted for the CROS system. Cotton Swabs… The Guilty Pleasure. The bad news: A study by Henry Ford Hospital shows a direct association between cotton swab use and ruptured eardrums. The good news: The study also shows that, in most cases, the rupture heals on its own and surgery is only necessary for the most severe cases. “In the past, many otolaryngologists have wondered if surgery is really necessary to treat a ruptured eardrum. The results of this study show that 97% of cases healed on their own within 2 months, proving that most cases do not require surgery,” says Ilaaf Darrat, MD, an otolaryngologist at Henry Ford Hospital and co-author of the study. Darrat and her colleagues concluded that proper follow-up with a doctor to test hearing after a case of ruptured eardrum is essential to ensure that no hearing loss was caused.